[NPR] To Haben Girma’s grandmother, back in East Africa, it “seemed like magic.” Her granddaughter, born deaf and blind, is a graduate of Harvard Law School and works as a civil rights attorney. 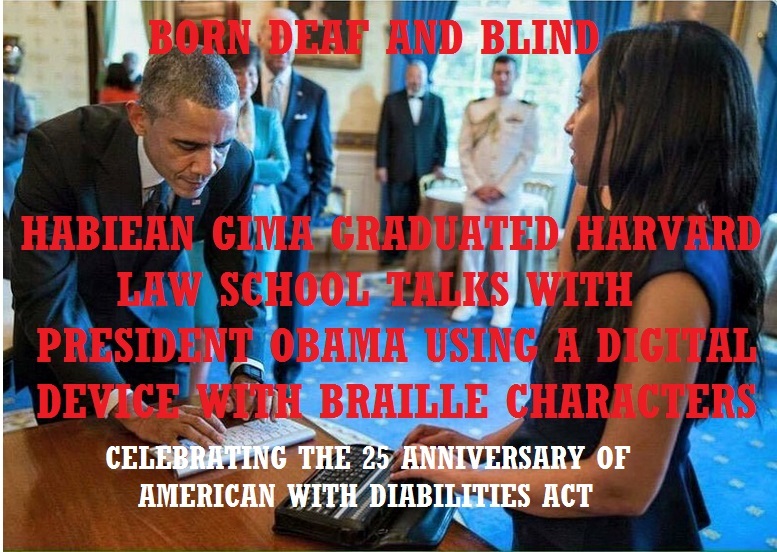 Girma told the story last week at the White House, when she introduced President Obama during a ceremony to mark the 25th anniversary of the Americans with Disabilities Act. By the time Girma was born in 1988, six years younger than her brother, her mother had made a refugee’s journey from Eritrea to the United States. And in California, a deaf-blind girl like Girma had a legal right to an education. In public schools in Oakland, she was educated alongside other students, leaving her mainstream classes for an hour a day to learn Braille. In an interview with NPR, Girma — who turned 27 on Wednesday — explained more about the family’s journey. In the winter of 1983, Girma’s mother, Saba Gebreyesus, left Eritrea. The war of independence with Ethiopia was going on. It was a two-week trek to Sudan, “walking at night to try to avoid the different military groups fighting in that area.” At one point she slept in a tree surrounded by hungry hyenas. A Catholic resettlement agency helped Gebreyesus move to the United States. In the United States, disability civil rights laws provided opportunities to Girma. TheIDEA law says every child with a disability is guaranteed an education, and the ADA bans discrimination based on disability. Still, when Girma went to college, she was unsure whether to assert her rights under the ADA. A turning point came over an everyday decision: what to eat. At Lewis & Clark College in Portland, Ore., Girma at first would walk up to a food station in the cafeteria and put out her plate. She’d eat whatever she was given. Sometimes she liked it, other times not. She wanted choice. (“What if there was chocolate cake at Station Four?” she says.) So the food service manager agreed to email the day’s menu, which she could print on a Braille reader. But the menu came infrequently; food service managers said they were too busy. Girma was reluctant to demand more. Mainly because it seemed trivial to complain about missing out on chocolate cake — or even getting a meal she liked — given her family’s own hard life in East Africa.